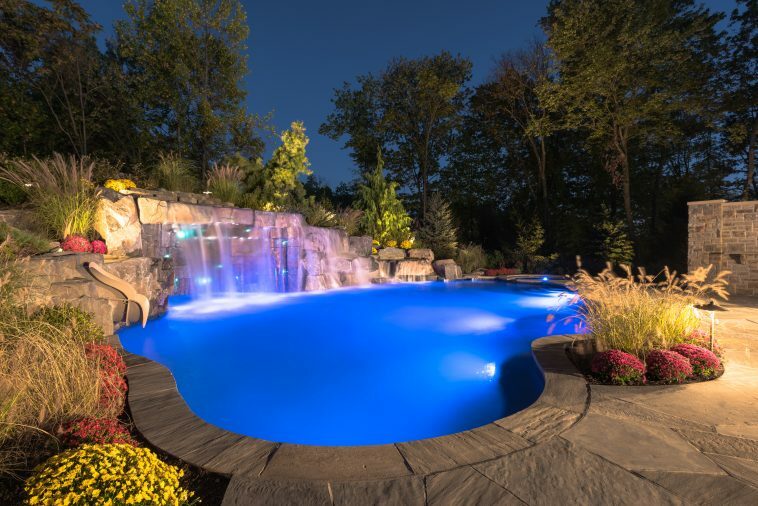 Luxury staycation in New Jersey relies on Pentair to power 1,000 sq ft pool with three waterfalls. For Chris Cipriano of luxury pool builder Cipriano Landscape Design, a backyard is a blank canvas for inventive and elegant design. A project in Saddle River, New Jersey, that incorporated a 12-foot mountainous structure into a flat yard was just the kind of challenge he relishes. And it’s no surprise that the result—a 1,000-square-foot swimming pool and glass-tiled spa with a swim-in grotto, three waterfalls, and a 45-foot waterslide–won a gold in APSP’s 2017 Awards of Excellence competition. The assignment was to thoroughly transform a portion of the yard into a recreational oasis that would serve for thoroughgoing relaxation, as well as for hosting parties and entertaining the homeowner’s five children. “This client wanted to implement, as much as he could, a luxury staycation feeling, so when he was in his backyard he’d feel like he was somewhere else,” says Cipriano. That sense of being transported is enhanced by the poolscape’s natural style, with the waterfall structure made of hand-picked-and-placed rocks and boulders and edged by voluminous greenery. The grey Tennessee flagstone deck is laid in an organic pattern, and iridescent blue glass tile in the pool and spa create a shimmery, deep-water look. The pool’s positioning also enhances this “natural escape” sensibility—Cipriano pushed it into the setback and used the built structure for privacy. The waterfalls are variable heights, ranging from eight to twelve feet tall. Several pumps regulate the waterflow, with a single pump providing a low flow through most of the pool and the subsequent pumps adding more water across all areas. One wide waterfall provides a curtain for the swim-in grotto, which is constructed of artificial rock designed to match the natural boulders and studded with fiber-optics for a starlight effect. The variable speed pumps that control the falls are from Pentair, as are the lighting, heating system, sanitizer, cleaner, and circulation equipment. The homeowners can use the Pentair app to control all aspects of the poolscape, including the fire pit and fire table that have low-voltage auto-igniters. Cipriano appreciates the three-year extended warranty Pentair offers when builders bundle its products; it provides great peace-of-mind to his clients. And he finds the support the company offers comprehensive. Pentair’s GloBrite low-voltage LEDs throughout the pool illuminate the stunning glass tilework, a sapphire 50-50 iridescent-non-iridescent blend from Oceanside Glasstile’s Muse Collection. The client liked Cipriano’s glass tilework so much that the pool incorporates an extended waterline of one foot (twice the usual six inches), a wide sun shelf in glass tile, and a spa entirely lined with glass tile. Oceanside Glasstile carries four different finishes, as well as some collections that incorporate various kinds of stone. They offer the option of mixing iridescent and non-iridescent tiles to provide play of light and depth of interest. The tile Cipriano chose for the Saddle River project may be blue, but it’s anything but a standard-issue element of the pool’s design. He’s a careful artisan with fit and finish, incorporating only full tiles for a polished and professional look. It’s the same care he brings to the rest of the materials he uses. Being in total control of all aspects of the pool’s design allows Cipriano to elevate his craft by experimenting with how various elements can fit together and balance each other. In this particular design, the interplay between a built environment and its natural surrounding provided rich fodder for his creative direction.